* Get taller and reduce pressure on knees and back. * Gel Shoe Lifts Extremely comfortable, Shoe Lifts, mold to the shape of the foot. * Excellent quality height increase shoe lifts, made from clear silicone. * Gel Shoe Lifts help you get taller, height increase of approx 1 – 3 cms with multi-layers. 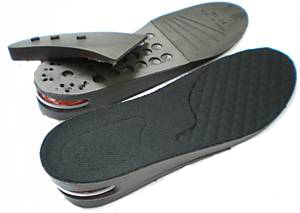 * Gel Shoe Lifts are durable and strong shoe inserts that can last a lifetime. * Get taller and find an increase in confidence. Contents: 1 pair of unisex shoe lifts pads (10 pads in total). * Tracking numbers are provided for all items.